He’s got a built-in cape, he can fly and he’s on a brave rescue mission. Want a super chuckle? Say hello to Pat the Superbat! Pat is an ordinary bat who dreams of being special. He’d love to be a superhero! But when you’re a bat, that’s not as easy as it sounds. Think about it: all bats can fly. All bats can find their way in the dark. And though bats don’t have x-ray vision, they all have ultrasonic hearing. Nifty, eh? How will Pat stand out among all these other superbats? Perhaps he needs to be a HERO – the most super thing of all! A lovely picture book. I read it to my Reception class and they enjoyed listening to it especially the boys. Even my 13 months old son listened to the whole story. I think he liked the pictures. They were large pictures that took the whole page. It had bold bright colours of red and yellow, and comic captions. As a teacher, I could see myself using this book to introduce bats or superheroes or unlikely heroes. I liked how the story is about that anyone could be a hero. Great way to promote self believe and increase self esteem. It also has a page of key facts about bats and uses key terms of echolocation and nocturnal animals correctly. Great overall read. 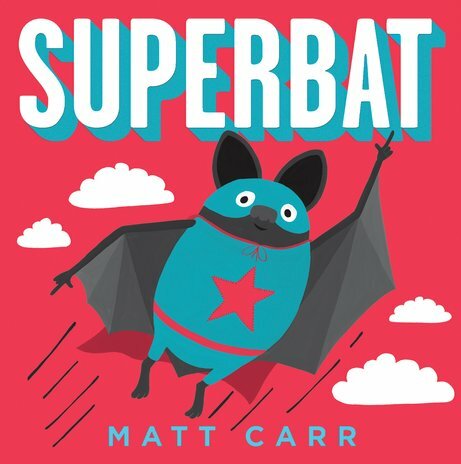 My kids love this book, and have loved learning more about bats as a result.